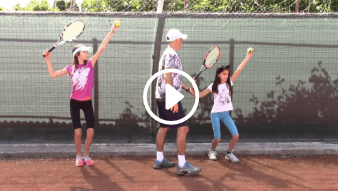 In this section you will see how Cosmin Miholca, a certified tennis teaching professional, teaches his own two daughters tennis, beginning with the first lesson where the kids learn the basics and continue their progress into becoming tournament players. This content is “unique” and a rare opportunity to see a tennis coach taking his children on the journey from beginning players all the way to competitive “warriors” (kids tennis lessons). 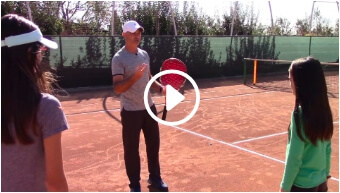 The information in these videos is meant to supplement on-court tennis training. Like any sport involving speed, equipment, balance and environmental factors, tennis poses some inherent risks. The author of these videos advises viewers to take full responsibility for their safety and to know their limits. Before practicing the skills described in these videos, be sure that you do not take risks beyond your level of experience, aptitude, training and comfort level. Tennis Lesson no. 40: Don’t Let the Ball Bounce! This lesson available for purchase; details here. – message for coaches & parents – important! Tennis Lesson no. 47: Spring Is Here!